The Payday Advance Agreement will be governed by applicable laws of the State of Iowa. Questions and complaints should be directed to this State Regulatory Agency by clicking here. 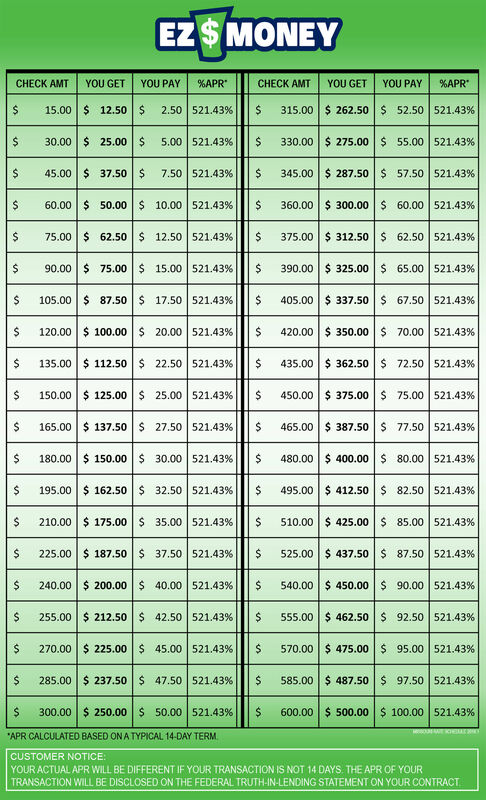 The maximum Payday Advance in the State of Iowa is $445.00. The maximum loan term in the State of Iowa is 31 days. The State of Iowa does not allow extensions. The Payday Advance Agreement will be governed by applicable laws of the State of Kansas. Questions and complaints should be directed to this State Regulatory Agency by clicking here. The maximum Payday Advance in the State of Kansas is $500.00. 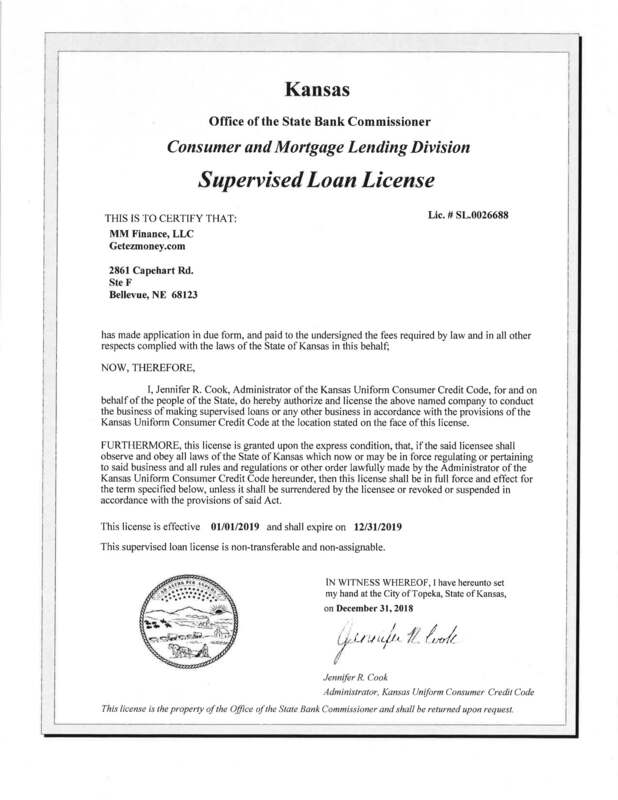 The maximum loan term in the State of Kansas is 30 days. The State of Kansas does not allow extensions. This lender offers short-term loans. Please read and understand the terms of the loan agreement before signing. 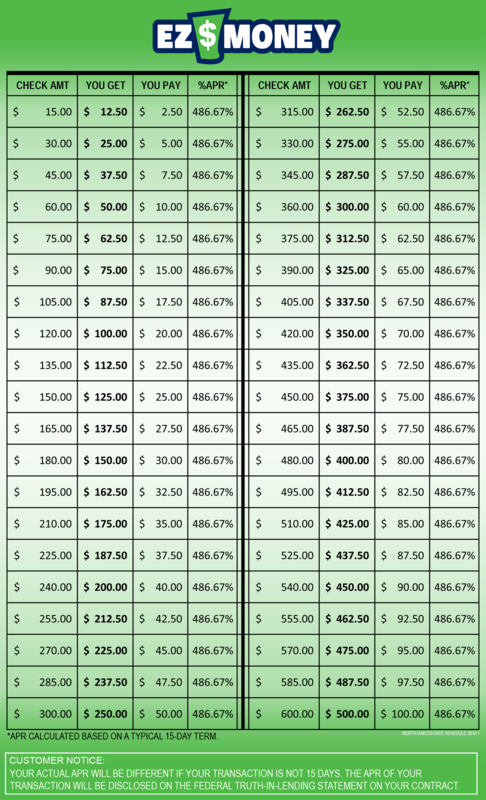 The maximum annual percentage rate being charged is 521.43%. The Payday Loan Agreement will be governed by applicable laws of the State of Missouri. Questions and complaints should be directed to this State Regulatory Agency by clicking here. The maximum Payday Advance in the State of Missouri is $500.00. The maximum loan term in the State of Missouri is 31 days. The State of Missouri allows up to 6 extensions. Each extension must include a payment of the interest due and a 5% reduction of the original principal. However, the aggregate total of all interest and fees, including the original, may not exceed 75% of the original loan amount. This lender offers installment loans. Please read and understand the terms of the loan agreement before signing. 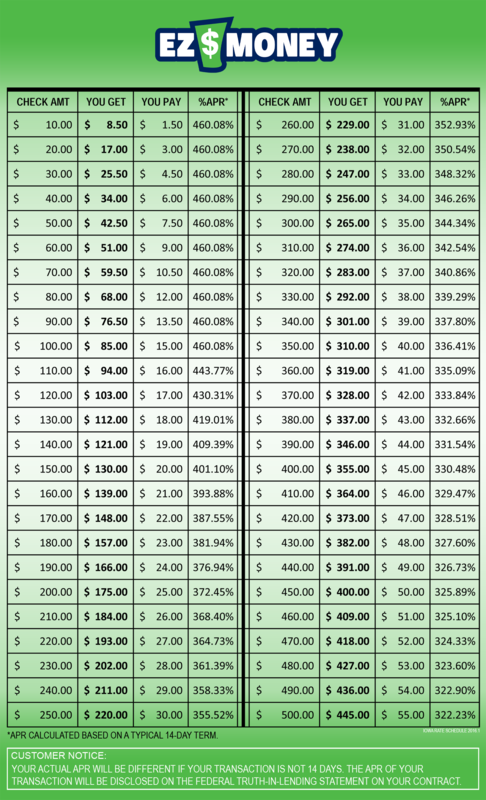 The maximum annual percentage rate being charged is 363.00%. 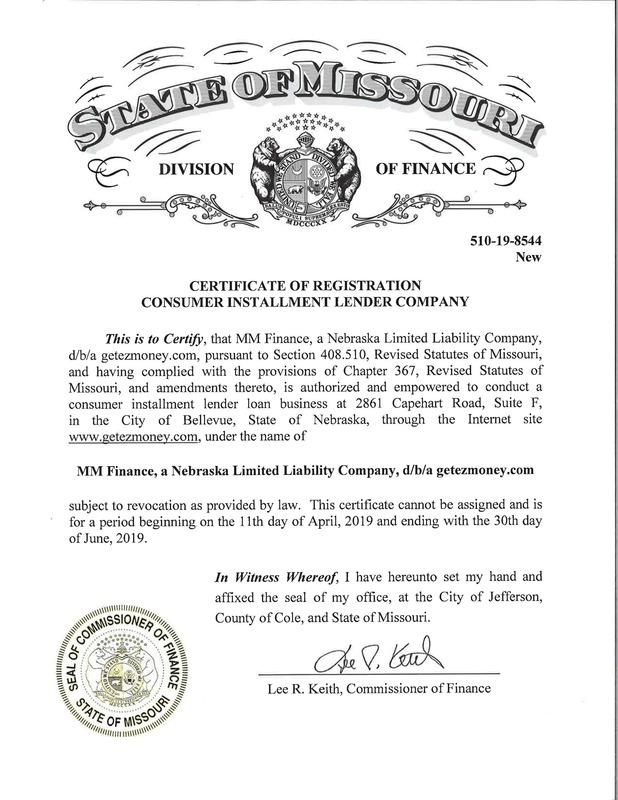 The Installment Loan Agreement will be governed by applicable laws of the State of Missouri. Questions and complaints should be directed to this State Regulatory Agency by clicking here. 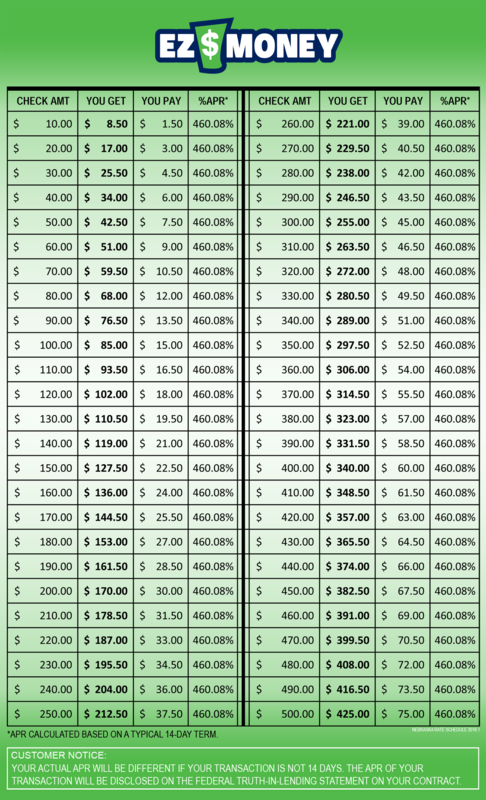 The minimum installment loan offered is $50.00, the maximum loan offered is $1,500.00. The minimum loan term for installment repayment is 4 months. There is no penalty for prepayment or early pay off. The Payday Advance Agreement will be governed by applicable laws of the State of Nebraska. Questions and complaints should be directed to this State Regulatory Agency by clicking here. The maximum Payday Advance in the State of Nebraska is $425.00. 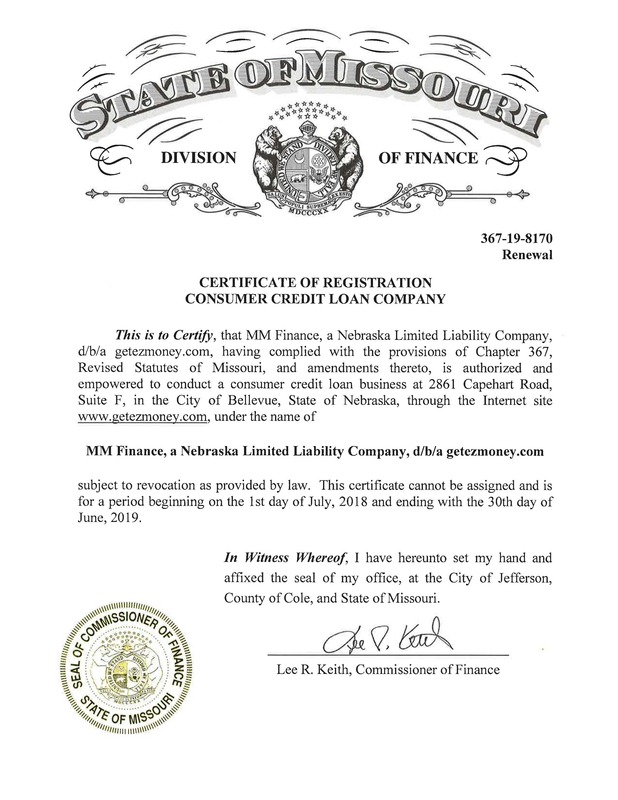 The maximum loan term in the State of Nebraska is 34 days. The State of Nebraska does not allow extensions. 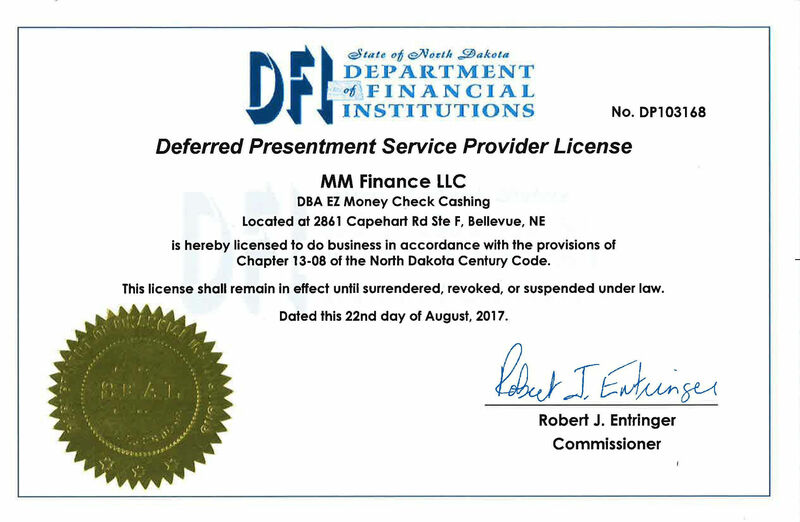 The Payday Advance Agreement will be governed by applicable laws of the State of North Dakota. Questions and complaints should be directed to this State Regulatory Agency by clicking here. 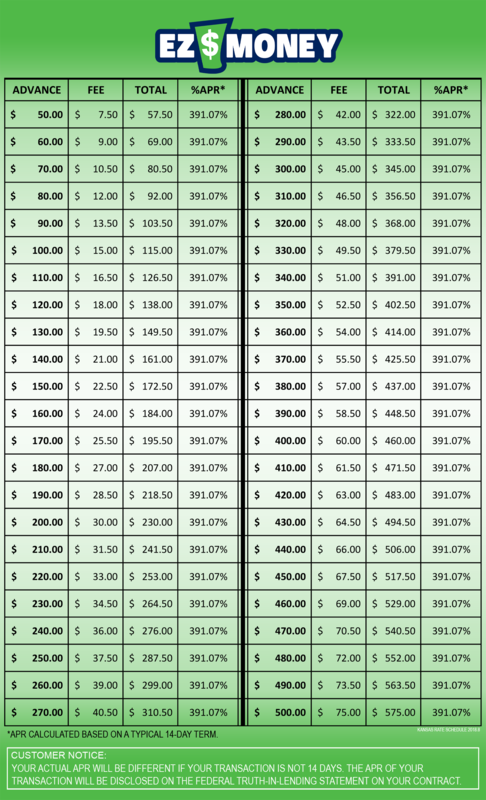 The maximum Payday Advance in the State of North Dakota is $500.00. The maximum loan term in the State of North Dakota is 60 days. The State of North Dakota allows for one extension. The fee for an extension is no more than 20% of the loan amount. The maximum term of the extension plus the original term cannot be in excess of 60 days. In addition, the term of the extension cannot be less than fifteen calendar days.